Imagine walking home late at night and wishing a church was open so you could ask someone about faith and say a quick prayer? It was to help meet that need that Friday Fridge first opened its doors back in 2006. It has now just marked 10 years of ministry and outreach to Southsea’s night-time community. Based at St Jude’s Church at the top of the main shopping centre on Palmerston Road, it gave those walking home from pubs and clubs the chance of a spiritual chillout at a time that suited them. Bacon sandwiches, real coffee, atmospheric lighting and ambient projections made it attractive for people to pop in between 10.30pm and 2.30am each Friday. Volunteers were happy to listen to questions about faith or personal problems until the early hours. Prayer installations gave guests the chance to engage directly with God. Over those 10 years, the focus of Friday Fridge has changed. Several of Southsea’s pubs and clubs closed or moved elsewhere. Individuals with mental health problems, who were homeless or were dealing with drug or alcohol addictions came more regularly. The opening times altered to 9pm-11.30pm to suit them. The free food and drink, the chance to chat, and the prayer installations remained. And a Bible study was launched for those who wanted to find out more. Many volunteers have been regular helpers over the past 10 years, but three have been ever-present – helping out at each Friday Fridge unless they happened to be ill or on holiday. Anne Manship has typically been behind the counter serving tea or coffee, and Andrew Malbon and Vida Weaver have been ever-present on ‘defrost’ duty – dismantling the Friday Fridge set-up early on Saturday mornings. The three of them were presented with thank-you presents at recent St Jude’s Church services. They also celebrated at a 10th anniversary party held at Friday Fridge last month. 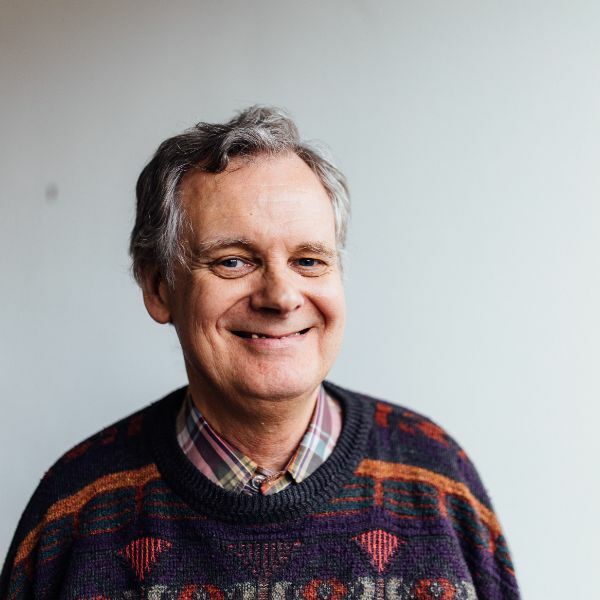 The Rev Mark Rodel, a former curate who was involved with the initial idea, returned along with other volunteers and guests from the past 10 years. 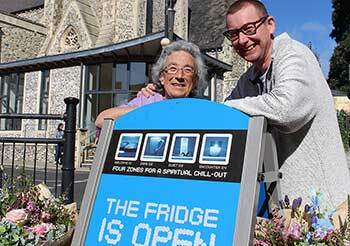 The current Friday Fridge leader, Jim Campbell, from Devonshire Avenue Baptist Church in Southsea, said: “I love it. It is a fantastic to be able to say to people that ‘church’ is available for you at a time that suits you. People have been amazed that we are open at that time, that we are giving away bacon sandwiches or cheese toasties, and that we are happy to talk to them about anything. “Over the years, there have been many people who have only ever dropped in once. But I hope they went away knowing that Christians are generous and that God is interested in them. “One of its strengths now is that there are a core of regulars who keep coming, because they are lonely, or want to go somewhere at night that doesn’t involve alcohol, or just because they have made friends here. 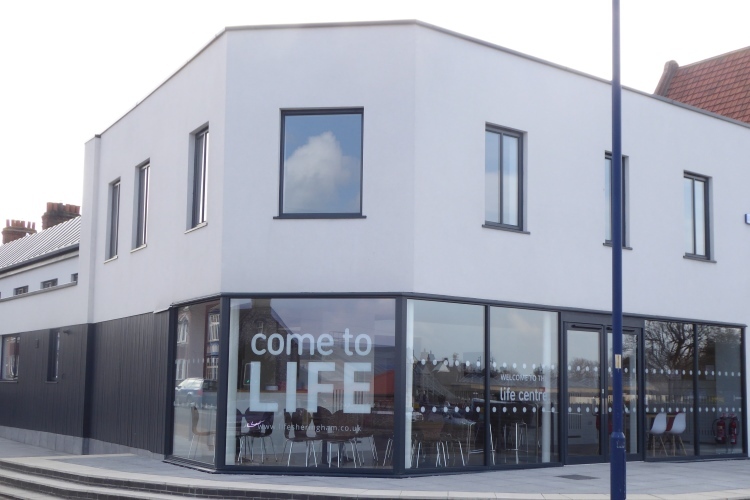 “I’m also pleased that those from other local churches have also been volunteering, and that we have made contact with Street Pastors who patrol Albert Road, and those who offer the Breakthru groups and Sunday Suppers at St Simon’s Church, because sometimes we meet the same people. For more details see www.stjudes-southsea.org.uk/join-in/friday-fridge.